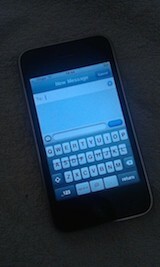 Could the iPhone 3G be the ultimate basic iPhone for those who aren’t interested in keeping up with the latest versions? I love the original iPhone – its design was superb and its legacy has given it iconic status – but it was far from perfect, lacking some essential features. A year later Apple fixed a lot of this with the iPhone 3G. While it doesn’t have that initial wow factor the original iPhone did, it is still a very good phone. When Apple launched the iPhone 3G it featured the same 412 MHz Samsung S5L8900 processor (underclocked from 620 MHz), 128 MB RAM, PowerVR MBX Lite graphics chip, and 2 megapixel (MP) fixed focus camera as the original iPhone, but it added 3G data speeds and GPS. It changed the design, giving it a curved plastic back and dropping the battery capacity from 1400mAh to 1150mAh. Oddly too, the original iPhone stopped at iPhone OS 3.1.3, while the iPhone 3G received iOS 4.2.1 – despite featuring virtually the same hardware. In defence, OS 3 runs very well on both the original and iPhone 3G. However, one of Apples biggest fiascos was when they released iOS 4 for the iPhone 3G. It really wasn’t optimised for these handsets, enraging a lot of owners. This was partially fixed in later versions, and 4.2.1 was the last to support the iPhone 3G which, whilst is still no speed demon, does go a long way to fix early iOS 4 problems. 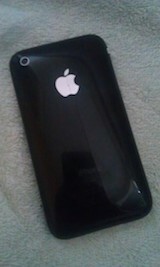 In the past I askes, Is There Room for the Original iPhone in 2012?. This is a look at if there is room for the iPhone 3G in 2014. The current iPhone world is full of dual-core power beasts – so can a 412 MHz single-core device still be used? This is Low End Mac, so we like to get the most out of older kit. My beautiful iPhone 4s broke, and I grabbed a slightly battered – but fully working and officially unlocked – iPhone 3G to see me through until my 4s was back. 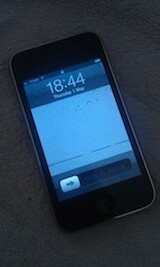 It has a small line of pixel outage on the screen and a large crack in the back casing. Normally my spare device runs custom firmware whited00r – however it is limited to OS 3, and I needed some iOS 4 apps for everyday use, and as it was officially unlocked, jailbreak wasn’t necessary. A lot of people need a mobile phone, but not many – even those who buy a brand new one – use all of its features. Owning a smartphone is no longer only for the business user or geek, just about every one has one. For an Apple fan who wants a nice touchscreen phone that syncs to their Mac and will make calls and texts and has extra functions, an iPhone 3G could be ideal. iOS 4 brought a lot with it, although the iPhone 3G didn’t receive all the new features (such as mulitasking and homescreen wallpaper). It added folders so you could organise your apps better, but the main thing for iOS 4 is its app support. Even now there are so many more apps for iOS 4 than for OS 3. Apple’s ‘last compatible’ app service recently introduced only works on iOS 4 and upwards. This means if you download the Facebook app on an iPhone 3G, even though the current version requires iOS 6, you will be offered the ability to download the last iOS 4 compatible version – breathing new life in to older devices. Previously there was no option to download older versions, so this was a welcome change. It may not have all the bells and whistles of a new iPhone, but it is still a great device? You can call and send SMS/MMS on it, so as a phone it is superb. You can email on it, so it’s superb as a portable email device. I even manually set up my iCloud email account on it. However, the Web is where it really pulls out the stops over the original iPhone. That addition of 3G means you can surf, tweet, and post to Facebook all with reasonable speed – rather than crippling GPRS. And adding in GPS means it could be used to look up your location or plot a map course. Its 2 MP fixed focus camera might not be able to match the likes of an iPhone 5s, but it is still good for snapping something to upload to Facebook – some basic non-smartphones still have 2 MP cameras today. As a music player, you just can’t beat Apple, so it also doubles as an iPod. Okay, so its not going to win any speed awards, but it will suit minimal needs. If you wanted to increase speed, you could install whited00r, which would make the phone a lot more responsive and give it some more features, but it would also drop it down from iOS 4 to OS 3.
iOS 4 runs slowly on this device, but then anyone looking at an iPhone 3G isn’t expecting extreme speed. They want a basic phone with some fancy extras. Perhaps I am picky. I know a few people who like Apple products but only have light needs from a mobile phone, who still use an iPhone 3G and are happy with it. Older iPhones are great, but can be expensive. The original iPhone is now becoming a collectors item, and prices are shooting up to ridiculous levels. Prices for original iPhones are reaching higher than iPhone 4 prices, which is absurd. A 3GS would give you iOS 6 and iMessage capability plus an increase in speed, but they are quite expensive too. 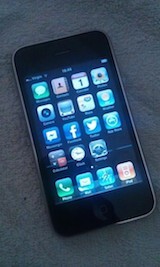 The iPhone 3G seems to be an incredibly cheap model, suited for those looking for a bargain. I have been using an iPhone 3G for a few days, and while I miss iOS 7 and the fancy features my iPhone 4s has, the 3G is a great device and it is nice to still be using an Apple phone. Is there room for an iPhone 3G in 2014? Yes. It depends on your needs, but they are far more capable than you think. * The original iPhone used EDGE networking, one generation older than the 3G used in the iPhone 3G and later. AT&T Wireless claimed average EDGE speeds of 75-135 Kbps, just a bit faster than a 56k dial-up modem. For 3G, 500 Kbps to 1.4 Mbps downloads – a huge difference. Great review! I have wrestled with keeping up with the latest and greatest in iPhones ever since I bought the 3G. Yesterday I got rid of my iPhone 5 and activated my old iPhone 3G on AIO Wireless. Much less money, and I can still do all the ‘necessities’.